Heat the butter in a large nonstick skillet set over medium-high heat. Once it melts and begins to bubble, add the onion and poblano and cook until wilted, about 3 minutes. Add the garlic, stir, and cook until fragrant, about 1 minute. Incorporate the tomatoes, cook for a minute, and as they begin to soften, add the sauce from the chipotles in adobo, tomato paste, Worcestershire sauce, salt and pepper. Stir well, cook for another minute, then add the shrimp and cook just until they change color, about 1 to 2 minutes. Turn off heat and scrape into a bowl to prevent the shrimp from overcooking. On a preheated comal set over low heat, heat the tortillas on both sides for a minute. Add about 1/2 cup of shredded cheese onto each one. 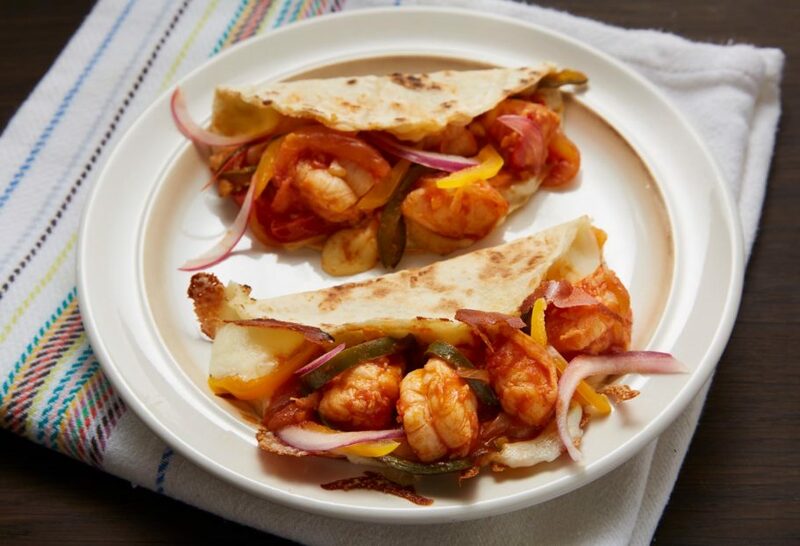 Once the cheese begins to melt, add a generous amount of the shrimp mixture, fold in half and continue heating until cheese has completely melted and the tortillas have begun to lightly brown and create a crust. Serve with sliced avocado and Manzano chiles and onion. Hi Pati, these were SO delicious! I love cooking as well as Mexican culture/cuisine and I have two little boys — so I am always inspired by your relationship with your sons and what a central role food seems to play in your family =). Thank you for a wonderful show! I have two quick questions: (1) Why are these called “Governor” shrimp tacos? (2) I loves chiles in adobo, but my 4 year-old is always put off by how spicy food is when I put them in. Any suggestions for how to incorporate that delicious, smoky flavor but minimize the spice? Oh you can read all about the story of how they got their name here: https://patijinich.com/governor-shrimp-tacos-blog/ And to make the chiles in adobo less spicy, you can remove the stem and seeds and use less of them. You will still get the great flavor but less spice. I made this last night and it came out great! The leftovers tonight were even better! Thanks Patti! Oh I love a good leftover, Gina! Hope you had a great Valentine’s Day, Crystal. Omg!!!! Just made this for a super quick weekday dinner and my family loved it! Thanks so much Pati, saludos desde San Diego! Hola San Diego and Crystal! These were wonderful Pati. I left the shrimp out for my sister who’s allergic and she loved it just as much as everyone else! I would like to try this recipe but I am not sure what chiplotes in adobe is? Oh here’s some more information, Pat: https://patijinich.com/chipotle_chiles_in_adobo_sauce/ Enjoy the enchiladas. These were really, really good. My wife—who is not a fan of “delicious messes” as you called them—ate these tacos with a knife and fork and loved it. That still counts, right? Made these tacos last night. They were delicious. My 8 year old, Lily, thought they were too spicy, but the rest of them really enjoyed them. We topped them with a homemade guacamole and thinly sliced red onion, and had fried plantains on the side. Que Rico! Oh poor Lily…but I’m glad the rest of the family enjoyed the tacos, Katy! Pati, I’ve made these several times since watching this episode and enjoyed them immensely. Can you advise the alternatives you recommend to poblano peppers (they are not always available at my grocery store and my solution is selecting peppers with similar Scoville ratings)? Also is there a recipe you recommend to make an adobo sauce separately, I don’t yet have a use for the chipotles and would prefer to make a batch of sauce to use (and freeze any excess). For these tacos you can use green bell peppers if you can’t find poblanos, Jennifer. And here’s my recipe for adobo sauce: https://patijinich.com/recipe/chipotle_chiles_in_adobo_sauce-2/ Enjoy! Pati, you are the best! Saw this recipe on Create and knew I had to make it. Super easy and delicious. Love how the flavors come together. I can’t wait to make it for friends!! Have fun with your friends, Tracey…and I hope they love the tacos! Making tonight ! Excited, love your recipes so much ! Never disappointed! Beyond happy to hear that, Macy. Thank you for the recipe. Made it tonight and everyone liked it. Careful with the manzanos, they can be really hot! Fantastic flavor all the ingredients put together. My family used to have a beach house south of Mazatlan (next door was the vacation house of Juan Millán, governor of Sinaloa in the late 90s). Have great memories of the food and drink while vacationing in Mexico. Thanks again!!! Oh what great memories…thank you for sharing, Bill! Thank you for tuning in, and I’m so glad to hear that Mexican food is your favorite. I appreciate your suggestion and comments. We love these tacos and we love you! Thank you for introducing us to chipotles in adobo sauce. So good! Oh I’m so happy to have introduced you to chipotles in adobo, Julie and James…so many amazing things can be made with them! Made these last night, delicious. Hope you had lots of fun cooking (and eating) them, Al and Eleonore. We made these this evening. Spectacular! So Delicious! Thank YOU Celeste and Brad.